This Ticket Tuesday we give you double the chances to win! 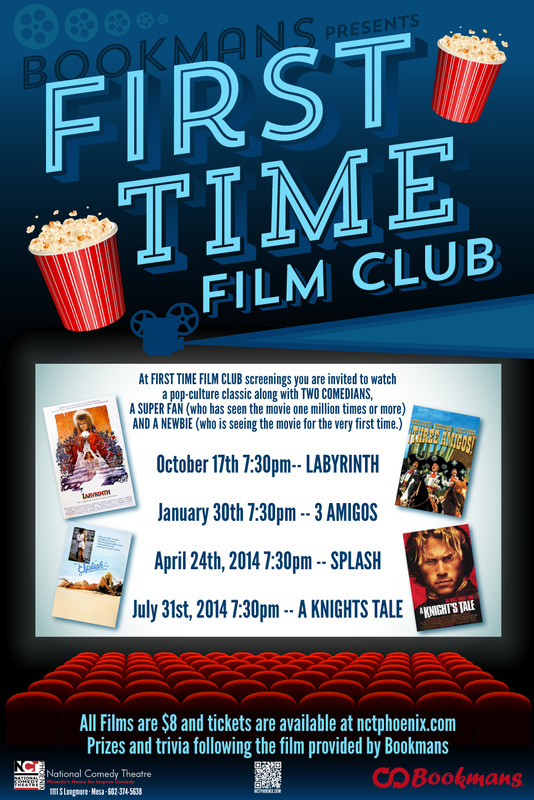 First Time Film Club, a collaboration of Mesa’s National Comedy Theatre and Bookmans Entertainment Exchange is designed to bring pop-culture classics to people who have never seen them before. Watch Splash with us at 7:30 p.m. on Thursday, April 24 or 1:30 p.m. on Saturday, April 26. Tickets are $8 and available at the NCT Phoenix website. The 1984 hit film Splash made stars out of actors Tom Hanks and Darryl Hannah, and director Ron Howard. This literal fish-out-of-water comedy is the latest screening for the First-Time Film Club, which brings together two comedians: one a super-fan who has seen the movie one million times or more and a newbie who is watching the film for the first time. They’ll riff on the action, providing a hilarious backdrop for this beloved blockbuster. After the film, you can win prizes in the trivia competition. To enter our Ticket Tuesday giveaway, tell us in our comment section which films you would like to see at First Time Film Club. We will select two winners using random.org and you will choose the date. Winners will be notified by e-mail sometime on Wednesday or possibly even Thursday. Comments are moderated and may take some time to appear. Please do not resubmit your comments — one is plenty.